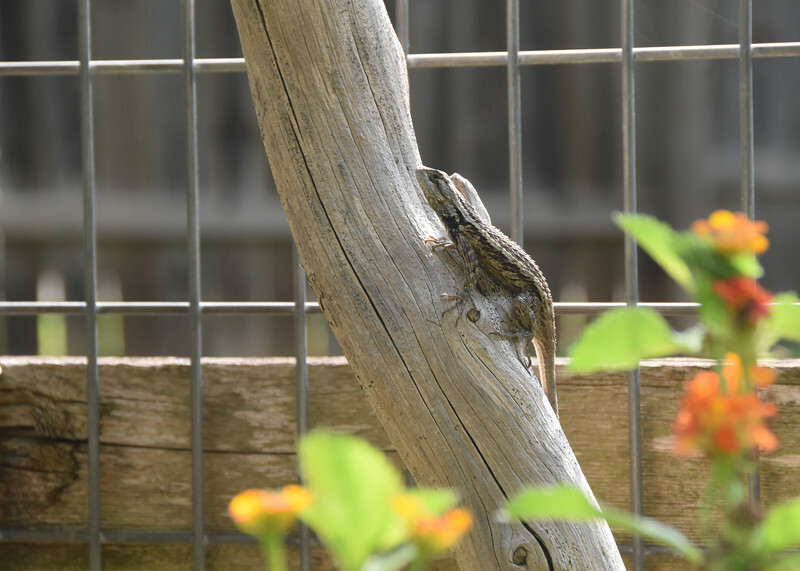 On my way to water the tomatoes, I spotted a Spiny Lizard sitting on a log in the sun. It did not move. It was watching me warily. I turned to get my camera from the house. When I returned, as I walked barefoot on the grass, I kicked a flimsy twig, swooshing it out of the way with my toes. I looked down. This was no twig. It was a small Rat Snake, as surprised at the swooshing as was I. It looked up at me from the grass as warily as was the lizard on the log. And then it slithered into the Turks Cap growing in great profusion at the base of the Pine tree. I looked over to see if the lizard was still there. It was. It had seen it all.